Five local rabbis pick Portland’s best bagel. 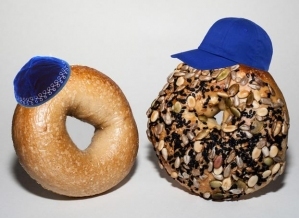 Rabbis' pick: Bowery Bagels plain bagel. Portland’s own New York Style bagelry has opened its doors on Northwest Broadway, complete with tile mosaics and boiled bagels with that unmistakable chew. Looks like all those free-bagel pop-ups were part of a down-low R&D: The Oregonian reports this afternoon that KitchenCru owner Michael Madigan has plans to open a bagel shop in Old Town, dubbed Bowery Bagels. The spot, across the street from KitchenCru in what was most recently an optometrist shop/art gallery called Ogle, will see Madigan, a New York native, creating bagels inspired by a childhood favorite: NYC's Glendale Bakery. 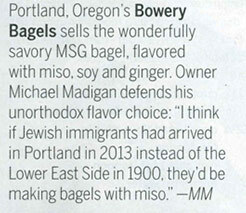 Since moving to Portland in 1987, Michael Madigan hasn't been able to find a good bagel. At least not as good as the one he ate as a boy at the Glendale Bakery in Queens, N.Y.
NW Broadway: Looks like those free bagel bonanzas aren’t just a temporary balm to our bagel cravings: KitchenCru’s Michael Madigan has announced plans to open his own bagel shop this summer. Bowery Bagels will take over a former optometrist office across the street from KitchenCru at 310 NW Broadway. Old Town will soon get more than just boiled bagels with the forthcoming Bowery Bagels storefront on NW Broadway. Owner Michael Madigan — also the founder of culinary incubator KitchenCru — will open up an artisan market inside the Bowery space dubbed CruMarket, highlighting products made by KitchenCru clients. According the Madigan, the retail space will give clients a permanent outlet to sell their products outside seasonal farmers' markets and informal pick-up days at the community kitchen. MICHAEL MADIGAN, the highly respected founder of downtown culinary incubator and commercial prep space KitchenCru, has been quietly building a number of successful food startups. Cru, as it is known, provides a well-outfitted kitchen, expert industry guidance, and a fertile environment for intellectual cross-pollination. We spoke recently about his customers, starting a scalable local food business, and his take on future food trends.